We all know how important it is to cook our food for the right duration, unfortunately many of us, especially as we grow older find it hard to keep track of how long a piece of meat has been cooking for, and low and behold, before we know it the whole thing is smoking. The Wrenwane Kitchen Timer is attractive looking and easy to use timer to prevent such catastrophes from happening. Sure, most modern cookers do have timers but the digits are usually small to read, the alarm not so loud and you cannot move the timer to the next room to keep an eye on it. This product is made of high quality hard plastic and boasts super large digits that can be seen across the room. The alarm is easy to hear in another room but not too loud to be deafening. You have two choices for placement, either use the magnet on the back to attach to a fridge door or pull back the retractable stand and have it sit on any flat surface. 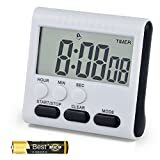 Timer can count up and down so can be used as a stopwatch as well as a countdown timer, ideal for cooking food, homework, gym workout, sports, games, time out (for kids), office and classroom timer activities. 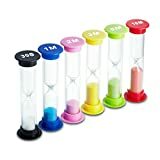 The item is a set of 6pcs hourglass sand clock timers in different colors, which includes 30sec / 1min / 2mins / 3mins / 5mins / 10mins sandglass. It is made from durable PVC, ABS, glass tube and sand. Very lightweight. 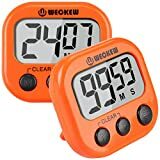 They are perfect for timing cooking, games, exercising, experimentalize and so on, can teach your kids about the time meaning with this visual angle. A quite good gift for your kids. ▪ Color: 6 different colors. ▪ Material: Durable PVC, ABS, Glass Tube and Sand. ▪ Size: About 3.3×0.98 inch. ▪ Counting time: 30 seconds, 1 minute, 2 minute, 3 minutes, 5 minutes, 10 minutes, each one with 10% time deviation. ▪ 100% brand new and high quality Colorful Hourglass Sandglass Sand Clock Timers. NOTICE:This is a sand timer made for games. It is not a precision timing device, so there is time deviation. 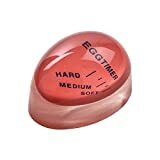 A simple and easy to use egg timer for cooking perfectly soft, medium and hard boiled eggs. Heat sensitive colour changing indicator signals when cooked to the required taste. Also cooks mulitple eggs to different tastes. 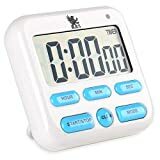 Easily Operated and Multi-functional Digital Kitchen Timer"The digital kitchen timer is good for daily limited time activities, especially for cooking issues. 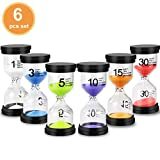 A set of 6pcs hourglass sand clock timers in different colors, which includes 1min / 3mins / 5mins / 10mins / 15mins / 30mins sandglass. It is made of durable PVC, and high borosilicate glass. Very durable and shock-resistance. They are perfect for timing cooking, games,exercising, experimentalize,decoration and so on. can teach your kids about the time meaning with this visual angle. A quite good gift for a birthday gift, kids toy, children's gift, Valentines Gift, souvenir etc. ☑ Color: 6 different colors. ☑ Size: About 3.7×1.6 inch each one. ☑ Counting time: 1 minute, 3 minutes, 5 minutes, 10 minutes, 15 minutes, 30 minutes, each one with 10% time deviation. 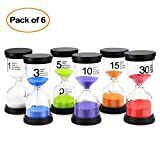 ☑ 100% brand new and high quality Colorful Hourglass Sandglass Sand Clock Timers. 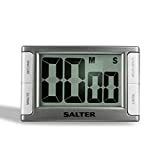 ☑ Note: This is a sand timer made for games. It is not a precision timing device, so there is time deviation. 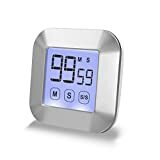 Wellehomi Multi-Functional Magnetic Digital Kitchen Timer with Large LCD Display. Our Wellehomi digital cooking timer is a good tool for you and your family. It is suitable for kitchen, public places, living room, office, bathroom, study,bedroom,class room and other places. 1. Made of high quality material, very fashionable and stylish. 1. Easy to set up and use: At first, open the battery compartment cover, and then install the battery with correct polarity,the device enters CLOCK mode. And then, under CLOCK mode,Press the 'M', 'S' button to set the time you want, press START/STOP button one time to change to COUNT-DOWN timer mode. The back of the kitchen timer attached to the back clip, can be caught in the belt, portable use. Open small work light stent, can be supported on the table for convenient use. Close the bracket, the back of the magnet can be easily adsorbed on metal objects. The digital kitchen timer is a useful timer for limited-time activities, especially for kitchen cooking issues. It is also rather suitable for sports, midday rest and learning time controlling. It can be a helper for your own life. 1. When you put an AAA battery in, you should flatly push the cover in back. 2. The plastic film of the screen is to protect the screen from the dust, tear it off at the first time you operate it. 3. The timer's magnet can be adsorbed by steel furniture, such as the surface of refrigerator. 4. When it needn't to be working, remember to turn the black switch off or remove the battery. 5. Press the minute or second button over 2 seconds could adjust the timer fast. 1. Buy battery within the expiration date in proper shops to make sure that the battery is clean with no leakage and no corrosion. 2. Do not reverse the positive and negative terminals. The WECKER Kitchen Timer is attractive looking and easy to use timer to prevent such catastrophes from happening. 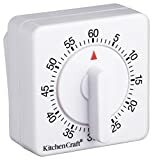 Sure, most modern cookers do have timers but the digits are usually small to read, the alarm not so loud and you cannot move the timer to the next room to keep an eye on it. 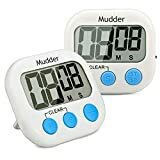 Timer can count up and down so can be used as a stopwatch as well as a countdown timer, ideal for cooking food, homework, gym workout, sports, games, time out (for kids), office and classroom timer activities. The maximum time set is 99 minutes and 59 seconds. The timer will remember the last setting, which is useful for repetitive activities. 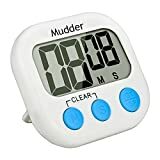 Multi-functional Digital Kitchen Timer and easy to operated. 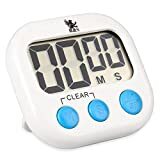 The digital kitchen timer is good for daily limited time activities, especially for cooking issues.With the loud alarm, you will not miss your time and you will enjoy the cute design and flexible placements with its strong magnetic force and hook back. It also can be applied to sports, midday rest and learning time control. It is a good helper to make you be the host of your own life. 1. When you put the batteries in the timer, you should flatly push the cover in back. 4. No action for 5 min under"Timer" mode, the device would return to Clock mode automatically. Have you ever forgot the time when you have cooked until you smell something is wrong or something has been cooked too long? Have you ever felt you always did something in a low efficiency? CEEBON touchscreen timer will help you solve these problems. 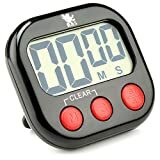 It's perfect for cooking food, homework, gym workout, sports, games, office and classroom timer activities. Also fit for kids to use as a time reminder that it can help strengthen the concept of time and do things efficiently. 1.Timer is set by the M and S keys. Count down/up Time ups to 99 minutes 59 seconds. Alarm sound lasts for 30 seconds. 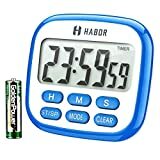 2.Touch Screen Timer with LCD backlight, easy to see when at night. Great for people who doesn't have a good eyesight to use. 4.Kithcen Timer with magnet back, large screen, big didits and loud alarm sound. 5. Portable to carry: Good size, Portable to take with you. A reliable partner in your life, kitchen cooking, homework, sports, experiments, noon break ect. 1.Te set count up time: In inatial state, LCD display shows 00:00. Press START/STOP button to go directly to the count UP mode. 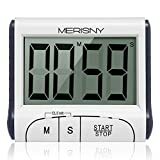 2.To set count down time: In inatial state, LCD display shows 00:00, Press MIN /SEC button to set the countdown Min and Sec, and hold the key to rapid increase. Than press S/S to start the countdown. 3.When the countdown timer reaches 00:00, there is 30 seconds alarm, press any key to stop the alarm and turn off the backlight. 4.Press Min or Sec key, backlight light last for 5 seconds, press S/S key, light will last for 30 seconds. 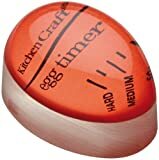 The digital kitchen timer is good for daily limited time activities, especially for cooking issues. You will not miss your time because of the loud alarm, and you will enjoy the cute design and flexible placements with its strong magnetic force and hook back. It also can be applied to sports, midday rest and learning time control. It is a good helper to make you be the host of your own life. 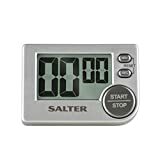 Counting up or down to 99 minutes and 59 seconds, this easy-read, compact timer with clear display and loud beep will help you keep cooking under control. Magnetic or self-standing.